Huge snowfalls in late March will see great spring skiing in April. Book now at Chalet Buet and receive end of season discounts. Mountain Safari provides you with two high quality self-catered ski chalets in the hamlet of Le Buet close to Argentiere in the Chamonix Valley. 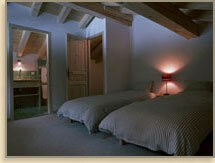 Chalet Montet and Chalet Buet are both traditional chalets yet modern and spacious sleeping 12 and 6 respectively. Both are perfectly situated for all levels of snowboarders and skiers being close to Le Tour and Les Grands Montets ski slopes. Both Chalet Montet and Chalet Buet are next door to Vallorcine - a hidden gem of a village close to Argentiere yet tranquil and beautiful, with it's own restaurants, shop and family run Hotel Buet for a great apres ski beer or two! 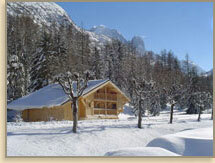 Chalet Montet sleeps 12 people accommodated in six twin or double bedrooms all with ensuite bathrooms. 5 bedrooms have balconies with mountain and river views. Chalet Montet is a new, yet traditionally built, wooden chalet that is easily spacious enough for 12 people. The kitchen has a large range cooker, fridge freezer and dishwasher with a separate utility room for washing machine and dryer. Under floor heating plus an open log fire keep you and your ski boots cosy! A separate snug area with Sky TV plus a games room for table tennis and watching dvds means children and adults can fully relax. Chalet Buet sleeps 6 people comfortably in two double rooms and one twin and having once been where we live it has a very homely feel. The large double room upstairs has a free standing roll top bath and a king size African dhow wood bed. Along with a modern design log fireplace (as seen in the Albert Premiere michelin starred hotel in Chamonix) adds to some of the unique features you would be unlikely to see in other self-catered chalets. Along with all the mod cons a separate bathroom with shower, dishwasher, washing machine and tv/dvd player your stay is ensured to be relaxed. The ski options are huge from Le Tour to Les Grands Montets to Brevant to Flegere all are within ten minutes drive or train ride away from each other. Each ski area is very different and there is skiing and snowboarding for all standards. Our ski chalets are situated closely to the new bubble lift in Vallorcine which takes in you into the Le Tour ski area. Here there is skiing for beginners to serious off piste skiers. At the bottom of the bubble boasts one of the best restaurants in the valley, the L arret Bougnette. Other than ski, snow board, ski tour or cross country ski, you can make use of Chamonix s shopping and restuarant facilities, ice rink and swimming pool. Argentiere has shops and restaurants for the non skiers and if you go further a field to Martigny in Switzerland you can soak in the in door and out door thermal baths. Chamonix has more to offer in the summer than in the winter. Mountain biking, hiking, mountaineering and rock climbing are a few of the out door pursuits on offer. Closer to our chalets you can walk out of the door and within minutes be on the trail up through the stunning Vallee Berard making for lunch at the Refuge Berard (3/4 hours walk) returning again that afternoon for tea at the chalet (two hours walk). "Our extended family would like to thank you for lovely accommodation in Chalet Montet and Chalet Buet for Christmas week. See picture attached. We really enjoyed the Vallorcine valley because it is far less developed than the Chamonix valley. Our party was delighted with the beauty of the mountains which we skied, snow shoed and hill climbed. (Great for the non skiers) Having the train on the doorstep enabled independence for everyone, particularly important for teen and twenty kids who took themselves off....having learned on the first day that it is necessary to get organised and get to the train on time! Toby & Lou could not have been more helpful. Nothing was too much trouble. They loaned members of the group dishes and even recipe books, helped to tweek the water heating system which was struggling a bit, and found a baby gate from their friends to lend us, although in the event it was not possible to fix it in place. Most kind. They have a great relaxed manner with guests. Great living space accommodated our communal meals for 18 people in Chalet Montet. The TV area and Games room spread everyone out so it never felt a crush. Having individual bathrooms is excellent and was one of the reasons we booked with you. Being able to self cater was the other reason. It worked really well for us. Each family took a 24 hour shift and then sat back and enjoyed others catering. FYI La Fontaine Chambre d'Hote was lovely and Belleview Lodge with the new manager Gudron & her chef Samion in charge was charming and friendly. We would recommend both highly."